The England captain seemed set to end his 27-innings wait for a century when he edged a Ravindra Jadeja long-hop down the leg side to wicketkeeper Mahendra Dhoni to depart for 95. That ended a stand of 158 with Gary Ballance, who moved to his third ton in five Tests to lead England to 247-2. While Ballance was the centurion, the day revolved around Cook, whose barren run had mirrored the poor form of his side and led to ex-England captains such as Michael Vaughan, Mike Atherton, Kevin Pietersenand former batsman Geoffrey Boycott to call for him to resign. Cook, whose previous 27 innings had yielded only 638 runs at an average of 23.62, has repeatedly claimed he will not quit, despite presiding over a 10-match winless run. And this knock will go some way to ending any doubt over his immediate future, with two more matches against India coming before England have an eight-month break from Test cricket. England crumbled to a 95-run defeat by India in the second Test at Lord’s to extend their winless run to 10 matches and increase the pressure on captain Alastair Cook. The hosts collapsed after lunch to a series of reckless shots and were bowled out for 223 to hand the tourists a 1-0 lead in the five-match series. Joe Root (66) and Moeen Ali (39) gave England hope with a partnership of 101 to take them to 173-4, 146 short of their target. But after Moeen fell to the last ball before lunch, Matt Prior, Ben Stokes and Root were all out to pull shots in a disastrous 14 minutes of self-destruction as seamer Ishant Sharma took 7-74 – the best figures by an India bowler in England. 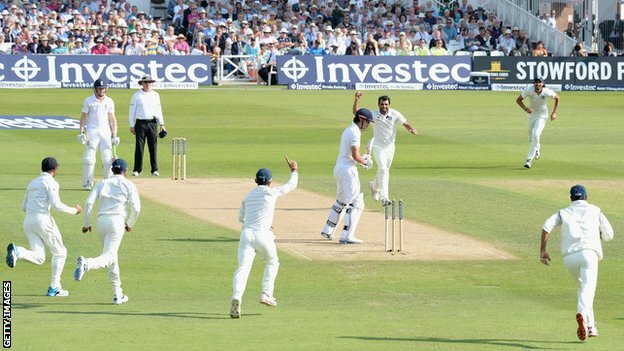 The match ended when James Anderson was run out by Ravindra Jadeja, whom he is charged with pushing and verbally abusingduring the first Test at Trent Bridge. 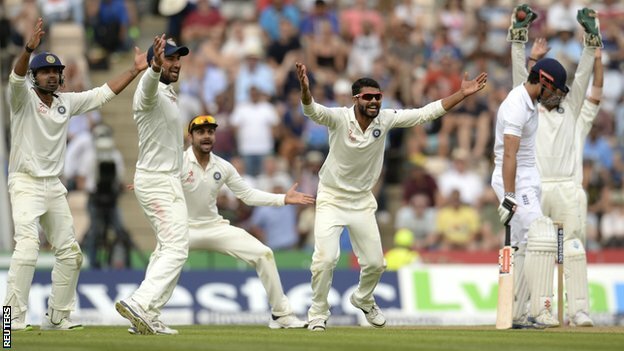 India survived a scare to draw the first Test at Trent Bridge and extend England’s winless run to nine matches. England raised their hopes of victory by taking three quick wickets on the final morning to reduce India to 184-6 – a lead of just 145. But debutant Stuart Binny’s composed 78 steered the tourists away from danger, with Bhuvneshwar Kumar (63 not out) and Ravindra Jadeja (31) also making key contributions as India reached 391-9 declared – 252 in front. As Alastair Cook rotated his part-time bowlers in the final hour, the game ended in comical scenes as the captain claimed his first Test wicket by having Ishant Sharma caught down the leg side before wheeling off in celebration. England’s run without a win – dating back to the draw at The Oval in the final Ashes Test in August 2013 – is their longest since 1992-93, while India have now gone 15 away Tests without victory. However, beleaguered captain Cook will take comfort from the way his team recovered their poise to give themselves an outside chance of victory on a largely lifeless pitch. England captain Alastair Cook’s batting woes continued as India took control of the first Test with a record last-wicket partnership. The opener was bowled off his thigh pad for five as England closed on 43-1 in reply to India’s 457 at Trent Bridge. On a day of fluctuating fortunes, the hosts had hurtled back into contention with four wickets for two runs after lunch to reduce India to 346-9 following Murali Vijay’s 146. But an extraordinary stand of 111 – India’s highest for the 10th wicket against England – between number nine Bhuvneshwar Kumar and number 11 Mohammed Shami, who both scored their maiden Test fifties, sapped the hosts’ spirit and put the tourists firmly back in charge. England captain Alastair Cook says he has no intention of stepping down and will continue to “throw everything” into the role. 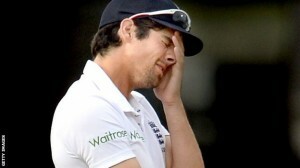 Cook’s leadership has been much-criticised, with England failing to win any of their past eight Test matches. But speaking on the eve of a five-match home series against India, the 29-year-old remained steadfast in his position. “Until that day the selectors decide I’m not the right man for the job, I will continue,” he said. “I think you have to be determined and stick to your guns.